2012 Hugo. Designed by: Deb Kosiba; Photo: Deb Kosiba. In which I attempt to explain how Hugo voting works, and why I like the system*. Here in Australia we have compulsory voting in elections. I have to confess that in politics, I’m a huge fan of compulsory voting. If you live in a country where voting isn’t compulsory, you probably think I’m crazy, but I like it. To me, it changes the onus on choosing to have a say in your country’s politics from ‘opt-in’ to ‘opt-out’. That may seem a small distinction, but it’s not. With non-compulsory voting you have to opt-in, and you need to do it twice. First, you opt-in to register to vote. Then you opt-in to vote on the day. Maybe you don’t feel like voting that day. The weather’s bad. You don’t feel well. Some bully is threatening you while you stand in the voting line. Maybe you missed the date to register. Or all the candidates are equally bad, and you don’t want to vote for any of them. With compulsory voting you have to opt-in, too, by registering to vote. By choosing to not do this you are already making a choice. Theoretically you have chosen to be fined rather than vote. Likewise, on polling day. Don’t turn up. You have chosen to be fined, rather than vote. Even if you do turn up, you don’t have to actually vote if you don’t want to. Get your name marked off, take your papers, put them in the box without nominating anyone. It’s not a perfect system, by any means, and there’s a whole stack of issues that come with it, but I still like it a lot better than the alternative. Despite the fact that I like my politics compulsory, voting for the Hugo isn’t compulsory, and I don’t think it should be. You opt-in initially by purchasing a WorldCon ticket. You opt-in a second time by nominating various works/persons for the ballot. And then you opt-in a third time by actually voting on the shortlist. 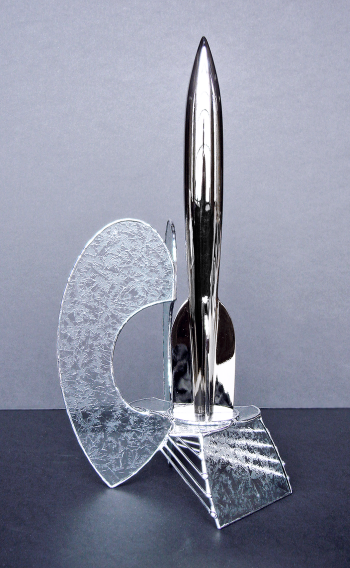 So what’s this got to do with the Hugos, then? Because that brings me to the other thing I like about the Australian voting system. Hugo voting uses a variation of the Australian preferential voting system for voting on the shortlist. Voting on the Hugo shortlist is done using what they call runoff voting. You go in and vote. 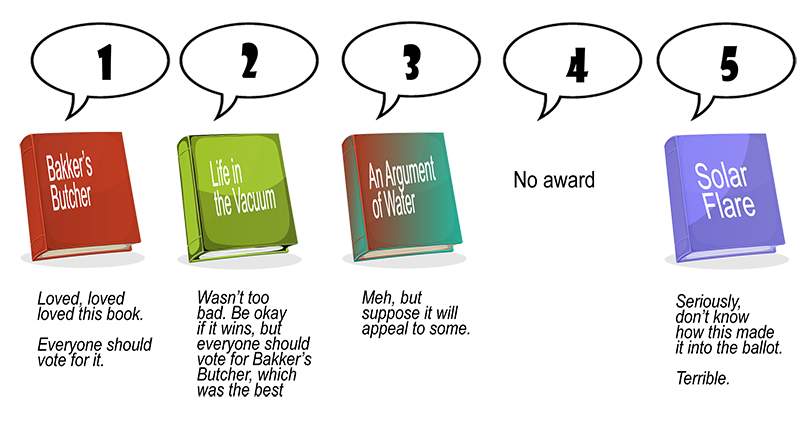 Four books, five options, because not awarding the prize rather than voting for a book you don’t like is a valid option. Let’s say you vote as follows. There can be two results. There’s no question here. Bakker’s Butcher got over 50% of the votes. It’s an outright winner. We then look at preferences. Solar Flare only got 6% of the votes. So we take all the second choice votes for Solar Flare and distribute them amongst the other candidates. Let’s say half the people who voted for Solar Flare voted Bakker’s Butcher second, and the other half voted for Life in the Vacuum second. We still don’t have anyone with 50% of the votes. So we take the next lowest. 20% of the people who liked An Argument of Water voted for Life in the Vacuum as their second choice. We have a winner. Life in the Vacuum. It’s not necessarily the winner you wanted, but there’s a good probability that more half the people voting put it in their top one or two books. Chances are it was also in your top 2-3. It’s important, when you vote for the Hugos, to give serious consideration to not just what you think should come out on top, but also to how you rank the others. And to where you place No Award, if you choose to use it. Should it? It got less than half the votes, which means that half the voters didn’t think it was the best novel. And more voters put Life in the Vacuum in second place. It’s not a perfect result by any means, but it does mean that when there is no clear-cut winner, the winner is the one deemed most popular overall. * A couple of caveats. This explanation is a rough approximation of how it works. I’ve left out a lot. If you want the full details, check it out on the Hugo website. Also, it’s not perfect—politically or for the Hugos. It can be gamed. No Award is valuable in these cases.